Apples are in season now and I am proud to be living in Minnesota . Two of my favorite varieties were created at the University of Minnesota: the Honeycrisp and the Zestar. The zestar is an early season apple which ripens in late August, so last month I picked up some at the farmers' market and made the best apple pie to come out of my kitchen, EVER! It absolutely maintains its structure yet is sweet, crisp and soft, all at the same time. Needless to say, that pie didn't last more than forty eight hours; embarrassing, considering there are only two of us. I'm pretty sure I ate most of it. If only I could eat apple pie every day....Unfortunately I can 't - my metabolism just will not allow it, darn, boring metabolism - so I've opted for this simple recipe for caramelized apples to supplement my apple pie fix, until thanksgiving that is! This recipe has all of the flavors of an apple pie, is not as time consuming, and definitely not as heavy in calories. Apples cook very quickly on the stove top so it's an easy middle-of-the week dessert. Any variety of apple you happen to get your hands on works well here, even pears will be good. Coming to think of it, caramelized anything is delicious. 1. Add half of the sugar and all of the butter to a large skillet over medium heat in an even layer. 2. Once the sugar begins to melt to a light brown color, add half of the spices followed by the apples. Stir constantly for four to five minutes until all of the apple slices acquire a rich brown color and they soften slightly. Remove from heat. 3. To make the almond topping, combine the remaining 1/4 cup of sugar, 1 tsp cinnamon, 1/2 tsp nutmeg and almond powder. Sprinkle over apple slices and top with yogurt to serve. I love this! It'll give you the flavors of apple pie, without the heavy calorie burden. yum! MMMMMMMMMMMMMMMMMMMMMM,...what else can I say? Looks delicious. Love doing the same thing with pears! yum....such a simple sweet!!! totally warm my heart! Exactly, this is a healthy way to enjoy the most famous fall fruit. Hope you got to try this recipe. I'm always delighted when you stop by. 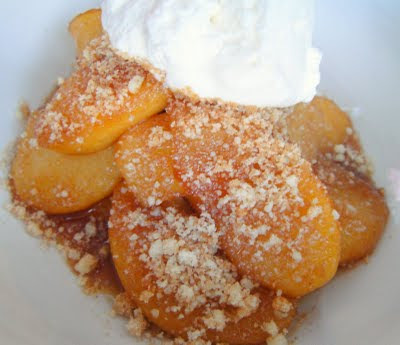 I have also done this recipe with pears which is also a good treat. Caramel goes well on almost any fruit.